Now, just a warning: this special chapter does not move the story forward. There are no big revelations or character developments. Rather it’s like an extra-long chapter of a normal Ouran story. When I first saw that’s what this was, I was rather disappointed because like so many of you, I wanted a graduation, a proposal, marriage, kids, or something along those lines. Disappointment can happen when 3 months of anticipation goes unfulfilled. Anyhow…I got over it after I finished the translation and started typesetting and the final image editing. With respect to other Ouran chapters, this one is on par with what usually happens in an Ouran chapter — the Host Club comes to the rescue of some special guest. I think the chapter focused too much on the setting of Barcelona. ( I don’t mean to make less of Barcelona. I’ve been there and I could ramble on for hours about it. That city blew my mind with respect to architecture and food. Believe me, I understand Hatori-sensei enthusiasm.) Yes, I like a background, but 7 or 8 pages of it before the story actually begins is a little much. This was keenly felt while I was translating. Fortunately, I’ve been to Barcelona 4 or 5 times on business trips, so I didn’t have to struggle with the Katakana for Spanish names. Once the story gets going, I thought it was enjoyable enough. The quipping between Kyouya and Nanako was cute and witty, though, I was sad to see no sense of attraction coming from Kyouya…booooo…As always the twins are funny, though, it really isn’t a shock that they want to go to art school. I think that was made clear in the previous short one-shot involving their grandmother. As for the TamaXHaru moments they were cute, but there weren’t enough and they didn’t last long. Honestly, I really want to know about them. Haruhi has some serious issues that need to be dealt with and I felt that this was a cop out. The fountain thing + The Sagrada Familia — I wonder if this is a little hint about a future special chapter in which Haruhi and Tamaki come back to Spain in 10-years as part of the “Fountain Curse” and the little promise made at the beginning of the chapter. I think if that happens, I can forgive all the Barcelona travel propaganda. The Sagrada Familia — If I can find my pictures of it I will do a another blog post. It is an AMAZING architectural feat. It is beautiful and over the top tacky at the same time. Those of you studying structural engineering will drool at the organic shapes. Antonio Gaudi — An amazing architect. There are buildings and spaces he designed scattered throughout Barcelona. They are weird and really capture the imagination. Monｔserrat Monastery — Home of the “Black Madonna”. This is another amazing place to visit while in Barcelona. The buildings look like they are building into the rocky landscape and the Monastery is amazing. Visitors are allowed to tour the cloisters. There’s lots of art and the Black Madonna to see. Again, if I can find my pictures, I will share them. Next up are J+K chapter 7 and Magnolia chapter 7! First and foremost: Thank you very much for doing such a great job! ^_^ I know it was troublesome for you, but you did well! Now then.. I think this chapter was a reminder to the fans that, even though they (the host club) are no longer a club and are going to be going their separate ways.. they're still the same and will probably be as close to each other as they are now in the future. A way of saying, “Don't worry. They'll all be okay!” ^_^ It was an amusing chapter (especially the part where they were trying to escape and Kyouya grabbed Tamaki. They was very funny). As for the Haruhi/Tamaki thing.. well.. yeah. I would have to agree. But, it was still a cute moment. ::shrugs:: And, wow.. Kyouya's brother doesn't look a thing like him! Anyhow, good job, thank you, and maybe next time something will develop. ''11 years later'' married with a son is cliche because it's been done a lot of times before. Why would you have wanted that? The final chapter was the final chapter. We still are lucky to have gotten anything though. @Anonymous — Actually, I was happy with with way it ended at chp 83. But I do have to admit, I do like happy couples with families. I'm sappy that way ;p.
thank you for the long-awaited special chapter! i must admit that as an avid fan, i am peeved that there was no “ending,” but ohshc never fails in enjoyment. the chapter was a splendid read =] also, will there be any more one-shots in the future? i really hate to see the first manga i've approached and love so much disappear from my life. LaurenMB: I thought the chapter was extremely sweet and I really loved it beginning to end! LaurenMB: I can see how it would be annoying to translate with all the SPain info, but just reading it… it's actually quite enjoyable. I loved the bickering between Nanako and Kyouya. And I didnt feel like the Tama/Haru thing was a cop out because the ending showed that she is going toward progress. Awww. That was so cute. I love how Kyouya goes one-on-one with Carmen. And Haruhi is learning how to make Tamaki dizzy – at will! A Lovely Special chapter. Just perfect imo. – It's like if you're writing “Bloody” instead of “Sacred” (I only know it because I'm from there :p ). – Thank you very much anyway ^__^ . Tch, I was hoping there would be something epic, but I guess slow pacing in a story is very Ouran-like. the chapter for what it was. As always, Ouran leaves an optimistic point of view in life… I really like that! 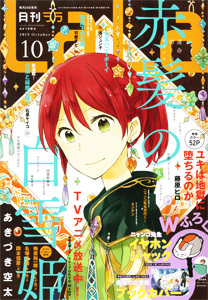 By the way, is there any info about new special or new manga from the author? I`m dying to know!! @Cat — I saw it spelled a few timea with one “L” and and accented “I”. I didn't see a double LL spelling. Is this Catalan spelling vs. Spanish spelling? thanks for the special chapter!!! 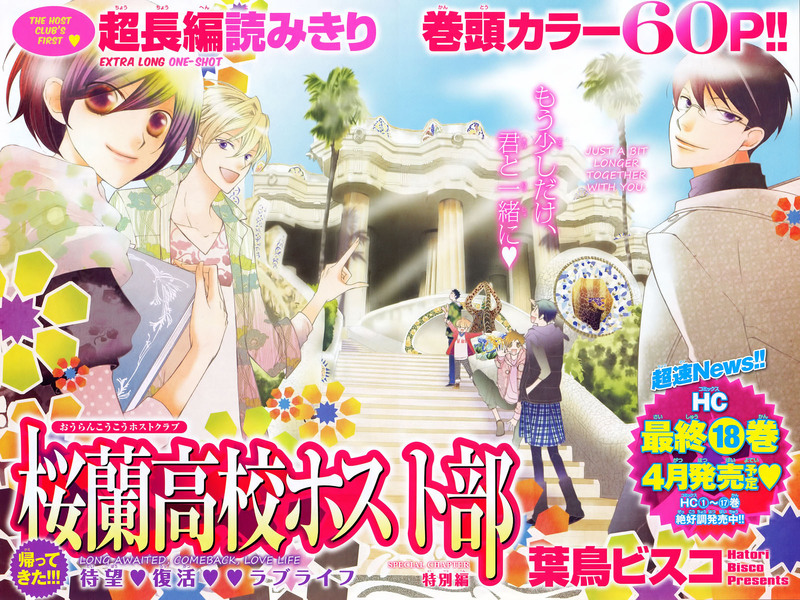 yes i agree that the author seems to spend too much time on promoting spain and yes that how come there is no form of attraction from kyouya..but its nice to seem more of ouran again! XD they still give me a good laugh whenever they do their overly enthusiastic antics haha..thanks for translating again!! and the architech Domenech i Montaner. Do you think there will be a second “Special Chapter”? @Emi — I don't know if there will be anymore Ouran material, but I wouldn't be surprised if more “special chapters” appeared in the future like what happened with “Hana Kimi” and “W Juliet”. Are you still planning to translate any extras from volume 18? Thanks.